In the past few months, reports have been published for Franklin, Tennessee, and downtown Nashville citing the need for affordable housing options. For most Middle Tennessee residents, these reports were more of a "duh" moment than a revelation of a real community need. Franklin holds small-town charm surrounded by beautiful countryside while being 30 minutes south of Nashville. 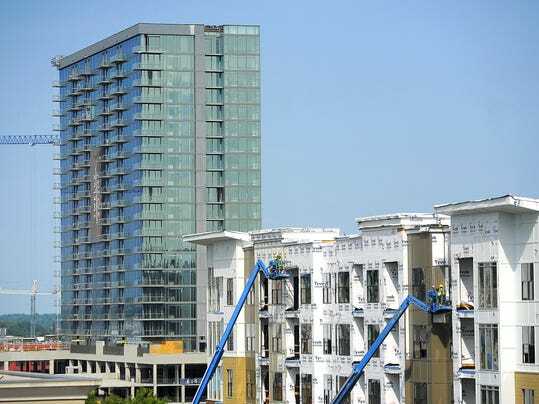 Downtown Nashville is in the middle of a growth spurt and robust recovery from the recession, and condominium and apartment building has resumed after about five years of stagnation. Several conversations with friends and coworkers about the rapidly rising rental and home prices here echo the concerns of the reports, but no one seems to really touch on the reasons I'm about to advocate for protecting or creating decent housing for low- to middle-income residents of these areas. The Franklin report found that 40 percent of its resident renters pay 30% of their income on housing, and 18 percent pay more than half. A worker making the area average wage of just over $54,000 per year could afford only 11 percent of the homes sold last year or the year before in Franklin. The downtown Nashville report noted that the rental occupancy has been around 98 percent for three years, pushing rental rates to painful heights, and downtown condo sales have hit record prices. There are 14 new projects on the books, including Ray Hensler's TwelveTwelve complex, which began as an apartment development but converted to condos after exceeding the lender pre-sale requirement of $35 million, hitting $49 million in reservations in mid-June. in the foreground, another housing development nears completion on Demonbreun. Shortly before the Franklin report came out, a broker friend of mine and I had been discussing how rent control in Manhattan came about and how it worked. When I sent him the news article about the need for affordable Franklin housing, he said he found it interesting that "the sense of entitlement that permeates our culture extends to the notion that somehow everyone should be able to live where they want regardless of whether or not they have earned the privilege." He said that no affordable housing existed because there wasn't a business case for it. In response to an email in which I asked Mr. Hensler of TwelveTwelve if he would consider developing a downtown project for middle-income folks, Hensler agreed with me "that having good options for folks at all income and demographic levels is important." His company, though, is small and focused on what they know, which is the luxury segment of the high rise market. A former multi-housing broker explained to me that developers can't get financing for so-called "affordable" housing and instead build to meet the market demands that bring a greater return on their investment. So why do city governments and organizations and citizens need to consider affordable housing within city cores? The most simple answer is because we need to remember the people who serve those communities in low-income jobs. The second reason corresponds with the first and touches on an issue that Nashville is struggling with as it grows: if people can't live near where they work, they commute, and that means more of their income goes to transportation, and the city experiences traffic congestion, air pollution, and a greater need for public transit options. According to the Franklin housing report article, 85 percent of the nearly 51,000 Franklin workers live outside of Franklin. "Of the five largest industries," the article continued, "none have average wages high enough for a worker to afford a single-family detached house. Only two paid enough to cover median rent." Anyone who drives south on I-65 or I-24 after 3:00 PM on a weekday knows that a significant portion of Nashville's working population also commutes, turning what might otherwise be a twenty-minute drive into a 45-minute to hour-long rush hour commute. Many choose to live in Williamson and Rutherford counties for their excellent school districts, but how many people are traveling into downtown from Antioch or Nolensville, the more affordable areas south of Nashville? As Middle Tennessee discusses mass-transit options, no one in the major publications has publicly suggested that maybe one part of the solution is to provide housing for those people who make low wages at area gas stations, fast food restaurants, dry cleaners, hotels, and other service industries, not to forget the creatives who fuel these cities' cultures. When I worked in the food-and-beverage and hospitality industries during and just after college in Charleston, South Carolina, I lived within walking distance to work at first, but I later moved to more affordable housing on James Island. After that, I sometimes spent thirty minutes to an hour on a bus to travel what would be a six-mile trip by car. As Nashville embraces a hotel and restaurant boom, the city needs to consider where all of those hotel and restaurant workers will live. As ServiceSource and UBS announce faster-than-expected downtown employment growth while, simultaneously, the city works toward increasing parking options in the blocks surrounding those offices, it becomes an obvious [to me, at least] need for more housing options for these workers. If Franklin wants to retain a more walkable, healthy, less congested community, it might need to consider affordable housing options for those who work in those quaint little downtown shops. family housing apartment communities at Charlotte and I-40. Downtown Nashville can be seen in the background. Wages for certain jobs will never keep up with the housing pricing in areas that are experiencing popular demand from people who can afford above-average prices per square foot. Those who live in downtown Nashville or Franklin are willing to pay the premium prices required to be near exciting new restaurants, shopping, and working options. Perhaps, though, we need to revise our impression of living the good life with good schools and decent housing: maybe it shouldn't be as much a privilege for those who worked their way up as it is a privilege to have coffee shops and drugstores and convenience stores in those exclusive communities. Perhaps having clean air and quiet roads requires supplying nearby housing options for the people who work at those places. There are a few options for the lowest incomes in Nashville. The Metropolitan Development and Housing Agency of Nashville (MDHA) lists 13 family housing properties on its web site, most of which look nothing like the old-school housing projects of decades past, and many are located near the downtown core. They also claim to have "served as the catalyst to other unique and innovative projects that are increasing housing options for low- and moderate-income Nashvillians," including the income-based Nance Place, a Freeman Webb property near Rolling Mill Hill in the downtown area that currently has a waiting list for its under-$1,000-per-month options. The Franklin Housing Authority also operates 288 public housing units for those earning low to moderate incomes. Compared to the populations of these cities, those options leave quite a large group of people who fall between those qualifying for public housing and those able to afford the Nashville average rental rate of $1,040 per month [as of February 2014]. For someone like myself living in that group, the public options make me happy but don't actually serve me. The non profit organization Urban Housing Solutions owns and operates 30 affordable housing properties around Nashville, some of which serve people in public service careers such as teaching and social work. Again, these options serve a community in need, but they don't serve me. Since I can't afford to buy because my husband and I aren't in a position to save for a down payment (or mortgage insurance plus housing insurance plus a home payment), we have few options. We will stay where we live now as long as possible, in the third floor apartment of a house we share with a vocal coach, where my husband competes for practice time on his drums with students practicing in the apartment below us, or move out of the area further west to the countryside or south to Antioch, increasing our rent a couple hundred dollars per month, or move to a neighborhood that sits beneath an interstate with high crime rates and still pay a hundred or more per month than we do now. One of us could get a second job, of course; that would be in the cards if we choose to have children. These are our options in the city I love. Market forces have made it this way. If market forces were the only things that mattered, then my broker friend would be correct in that I don't deserve to live in certain areas. If the work I do matters to the city, though--or if the work of the creatives in this city like my husband matter to a place called "Music City,"--there needs to be more options in the middle range. As Music Row becomes a battleground for developers hoping to capitalize on the housing boom versus preservationists who want to retain the unique character of the neighborhood, and as officials and activists fight over public transit options, I hope that people will remember the forces that prop up the money behind the property buyers. I will never forget a radio interview of Bill Gates' father in 2004 in which he said, in essence, that those who make the most money do so on the backs of those who serve at the lowest income levels. Cities need people to serve in those jobs that pay minimum wage. What has only recently occurred to me, though, was that everyone's quality of life can be improved in some way--reduced traffic congestion, better services, reduced poverty and crime--by providing opportunities for people to improve their living situation with not only jobs but with actual affordable living spaces. Housing people has become very difficult just due to the rise in the prices of almost everything. The new housing buildings are the best and cheap alternatives to it.